Please select an option Black Red Silver Gold Please select a color. Please select an option Iphone 7/8 Iphone 7/8 plus Iphone x Iphone xr Iphone x max Please select a size. You get the phone case and the mount. 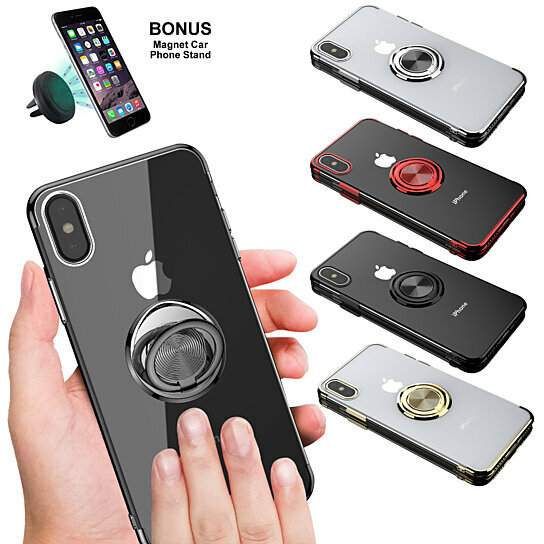 Just place the case on the phone and the magnetic mount into your car's air vent to securely attach and detach your phone to it easily. It is compatible with iPhone - 7/8, iPhone -7/ 8 PLUS, iPhone - Xs, iPhone - XR, and iPhone - MAX. All features for the iPhones are accessible through the proper cut outs. The case itself comes transparent with the border that matches the ring in Black, Red, White, and Gold. The magnetic mount comes in Black. The metal adhesive disk also included.